← Reviews, news, prizes and deals…. Imagine leaving the world you know to rocket off into the stars to an alien world. Imagine if you would be gone indefinitely–or perhaps the remainder of your life. No, really. Think about it. 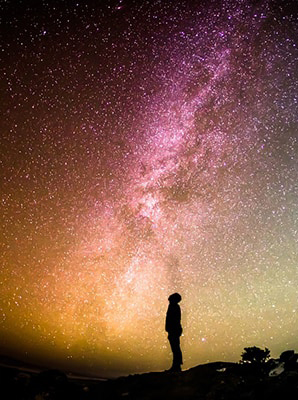 Consider what (who) you would leave behind, and how it would feel to if everything were not just different, but totally foreign–the terrain, the food, the people, the beliefs, the language–as well as the constellations and the moons in sky. Could you handle it? Would you? What would it take to get you to try it? Many science fiction books create alien worlds inhabited by the natives of those worlds. In Terran (Breeder series book 2), I show the “alien” world through the eyes of an expatriate woman, Tara Diehl who flees earth for the “safety” of Parseon. Although the planet roughly resembles earth with trees, grass and rivers, the culture totally differs–it’s cutthroat, aggressive, violent, and misogynistic. Males dominate and females are nothing more than breeder slaves. Except for visiting Terran women who are protected by treaty. But it is in this alien world that Tara attempts to build a new life. 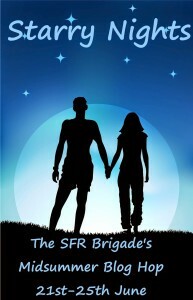 Welcome to the SFR Brigade Midsummer Blog Hop! Grand prize is a $100 Amazon or BN gift cards PLUS 42 books. Second place is $50 Amazon or BN gift card and a 33-book package. 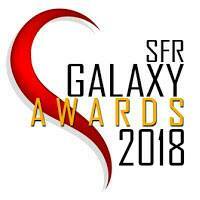 Three third places will be awarded that includes a $25 Amazon or BN gift card and 12 books. Entry for those prizes is by Rafflecopter. But wait, there’s more! I am offering a chance to win a $15 Amazon gift card JUST by answering a question. No Rafflecopter required. 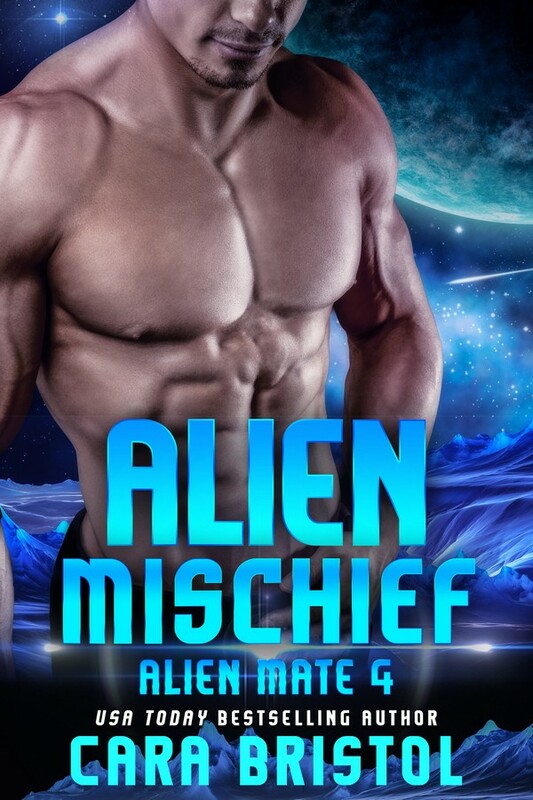 Read the short excerpt to Terran (Breeder series book 2), then answer the question at the end and be sure to give your email address so you can be contacted if you win! “No,” she lied. She squeezed her eyes shut against Ramon’s shoulder. She’d been pinned to the ground. They had sodomized her with their fingers—they just hadn’t gotten around to the rest of it, because the Commander had intervened. She recalled his growl, his shadow. The boot on her back had lifted, and her attacker had flown through the air. She’d heard a thud and a snap, and then the pounding of feet as the other two attackers had scrambled away. Answer this question for a chance to win a $15 Amazon gift card. If you left your home and moved to an alien planet what do you think you would miss most about earth? Remember to leave an email address so you can be contacted if you win. Drawing will be done using random.org. Well, setting family aside as they’d come with me, I think it would be the sky at night. I think seeing a different moon and stars would make me feel lonely or sad and be a reminder that I’m not home. Pizza!! LOL!! Love these books! I would not miss the men if I met one of those yummy commanders! Gravity, sunsets, birds? It’s hard to pick not exactly knowing what it is we’ll be missing. Movies. Thanks for the giveaway. Books and tennis. Thanks for the great giveaway. After reading your excerpt, I’d have to say my independence – lol. Sounds like a fabulous book Cara. If I left Earth, I think I would miss the sounds, smells, and some fabulous sights of nature. But, who knows what I’d find on the new planet. That is, of course, so long as my family is with me. Otherwise, I’d miss them like crazy. Not sure I could leave them behind. I’m really good at picking up and moving on without looking back, so I don’t think I’d miss much at all. Hopefully the new world would have something similar to a dog, because of anything, I’d imagine I’d miss that most. But if it didn’t? It wouldn’t bother me. New place. New adventure. I’m in. I would miss sitting in my garden watching the sun go down while I’m sipping a fruity drink. Oh and my bed, I love my bed. I’m with Donna, I’d totally miss my bed. I’d also miss my favorite foods. Lots of things I’d miss. Dark chocolate for one thing! Oooh very good question… I kind of imagine I’d not leave Earth knowing there weren’t things similar to what I enjoy to look forward to but just as when I moved overseas and missed little things I imagine there’d be a lot to miss. I think I’ll go with seasons because I imagine that if there’s one thing that’d be different it would be the seasons we have. The sense of feeling safe and really everything. One of my characters was forced to flee Earth, but she didn’t so much miss things as regret the things she could no longer do or never did, like just sit and watch a sunset. I think I would miss the local bush, wildlife & beaches. Not seeing my local birds & wild flowers would be the hardest things to leave behind. It was bad enough when I moved to London for 2 years & I knew I was coming home – eventually! Aside from family and friends, coffee, but they might have something much better! Presuming that I can bring the kids with me, I’d miss coffee. Really, when I was young and single I would have happily left, rode in the Tardis, whatever. Now? No. I want to stay because of my family. Great post, and thank you for participating in this year’s SFR hop! Assuming my family would be with me I’d have to say the normality of it all. I can only imagine what another planet would be like, chaotic and strange, so after the shock and awe wore off I would miss what I have always known. I too, would miss the familiarity of earth but the fascination for the new sights would dull the pain just a bit. I would miss going to the familiar places I love, museums and libraries. But I would hope the new planet would appeal to my adventurous. My family, without a doubt. And now I’m off to go grab the first book! Amazing excerpt!